A place to hang out with friends and colleagues, a place to enjoy the night with the band, a place to chill and relax while singing your favorite songs, a place to rest seeing the cool arts and an overlooking view of nature in a cold breeze. We're able to experience their ktv, singing out loud with friends while enjoying the food. We we're able to experience the night life watching the band, hearing their cool voice, seeing the metro skyline, other guest are enjoying the night with friends, drinking beers, jamming with the band. We we're able to experienced their hostel, rooms look likes you are in a hotel with some paintings hang in the wall that depend on the name of the room, like Melba's Farm room which happened to be our room for that night, Melba's Farm is one of the property of the Cafe Lupe owner located in Bacolod, in our room there are two paintings of what you can see in Melba's Farm once you visited in Bacolod. If you are planning to stay overnight in Cafe Lupe Hostel and Restaurant, breakfast is included and they have a menu that you can choose of what you want to eat for breakfast and also what do you want to drink. 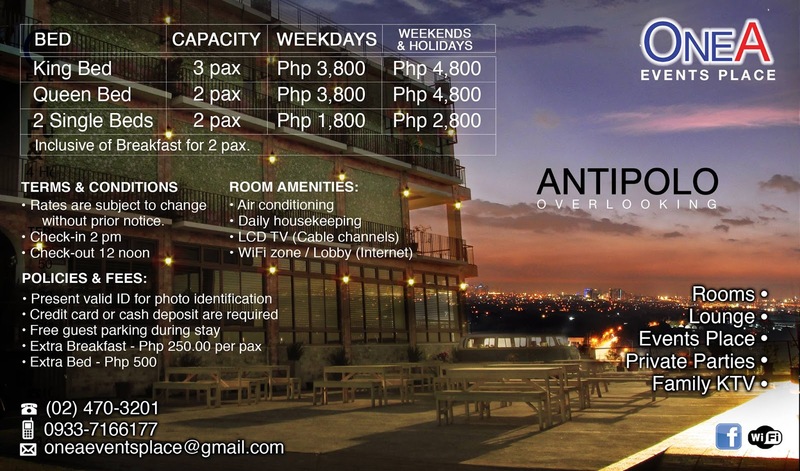 Please check the photo below for the room price range. Cafe Lupe have many things to offer and they are continuously developing the place and one of their next project is to have a pool on top of the bar that you book for a pool party with overlooking the metro manila skyline. You can also check their website for any promotions. Cafe Lupe is a place also for team gatherings or team party. After your stay in Café Lupe Hostel and Restaurant, you may want to visit the Antipolo Church and buy some goodies as presence for your family like suman, kasoy, kalamay and a lot more. Thanks to DRR for taking some awesome pictures.